UNSW Eastern Suburbs Bulldogs vs. UTS Bats – Henson Park on Sunday, June 3, 2018. Round nine was concluded with a twilight game at Henson Park on Sunday afternoon. It was an eastern derby as UNSW Eastern Suburbs took on the UTS Bats. In an extremely tight race for finals positions, it was four valuable competition points for the Bulldogs. When the two teams met in the opening round, the UTS Bats were successful. But this time round, it looked from the start that the UTS Bats would struggle to kick a winning score this time. Both teams had key players out and were short of full strength, but the first quarter of the game was a scrappy affair punctuated by turnovers. 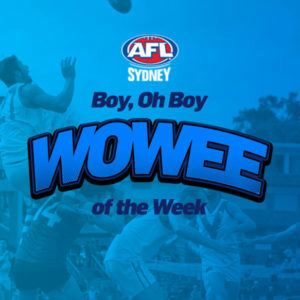 The UNSW Eastern Suburbs Bulldogs kicked the only goal of the quarter to lead by seven points at quarter time, but it wasn’t a quarter of footy that will go down in the classics. The UTS Bats were just as slow in the second quarter, but UNSW Eastern Suburbs got their game together to set up what would be the match-winning break. 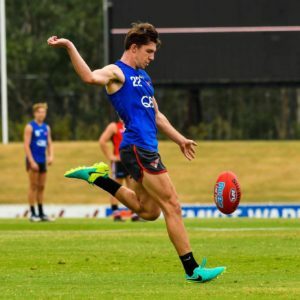 Kicks that had fallen short in the first term began to hit their targets, and a more coherent midfield was working together more effectively to create opportunities on the forward line. 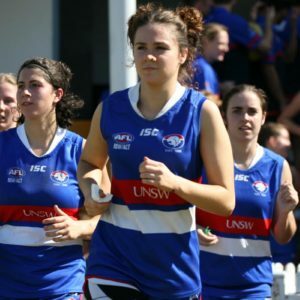 UNSW Eastern Suburbs added four unanswered goals in the second term to lead by 31 points at the long break, and the UTS Bats returned to the rooms with their tails between their legs as they were goal-less at half time. 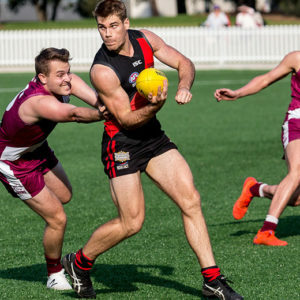 The UTS Bats finally broke their drought in the third quarter, but one solitary goal was not going to be enough to get them back into the contest. 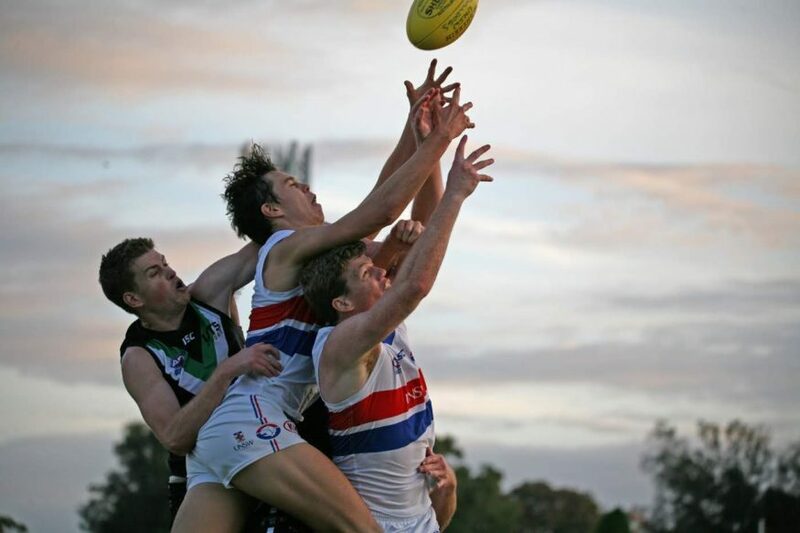 But they stopped the second quarter run of the Bulldogs to some extent, with the UNSW Eastern Suburbs Bulldogs held to two goals for the third term. It was a battle, physical at times, but there were few aesthetic highlights to entertain. Day had turned into night, and the sun had set on the UTS Bats’ hopes of repeating the opening round upset. At three quarter time UNSW Eastern Suburbs were 36 points to the good. The last quarter produced more attacking footy than the earlier quarters, with the UTS Bats salvaging something from a disappointing evening with three goals, while UNSW Eastern Suburbs also added three more to their tally. The final margin was 38 points. It took some fiddling with the calculators to work out the ladder, but UNSW Eastern Suburbs find themselves in fifth place. Just a few percentage points behind Manly Warringah Wolves and Sydney University but ahead of the East Coast Eagles. Just seven percent separate those four clubs on the ladder, and the race for finals places could be extremely tight this year. Harrison Collins, Michael Thomson and Darcy Cordell were best for UNSW Eastern Suburbs on a day when they got the job done. Rawson Kirkhope, Fred Cator and Brendan Browne were best for the UTS Bats. But it was a disappointing performance by UTS, who struggled all night to get their game going. The loss sees them two games and plenty of percentage out of the top five, and they will need a quick reversal of form to get back into the finals race. So at the half-way point of the season, the North Shore Bombers remain on top. The Pennant Hills Demons are a game plus percentage behind in second place, with a two-game break behind them. But then it gets extremely tight, with Manly Warringah Wolves, Sydney University, UNSW Eastern Suburbs and the East Coast Eagles level on games and with just seven percent separating them. Camden are a game behind them, and then a further game back to the UTS Bats. The St George Dragons with two wins and Western Suburbs with one win have some work to do to get back into the finals race.